Read–Plant– Water– Repeat. Books to share in the Garden. It seems like spring really is here this time. We had two days of 80 degree weather, which, really now, is summer, isn’t it? But today it has cooled down to a more typical Wisconsin spring: overcast with a hint of rain in the air. Who am I kidding? It’s 40 degrees and freezing cold out today. My family in Northern Wisconsin had a foot of snow—on May 2. Over last weekend, however, my neighbors were out diligently working on their yards. I went to a luncheon at the museum instead. Had company on Sunday, and oh, almost forgot: suffered with an infected tooth all weekend. So I didn’t get any yard work done. The tooth is better but I still have very little energy to pull weeds, mulch or plant. Sitting on the porch one sunnier day I saw some bugle weed encroaching on my epimedium so I actually pulled a few strands of that. It doesn’t take much physical energy though to read my favorite garden themed books for kids. Getting off my duff and writing the reviews—that’s another story. But here goes. Hana in the Time of the Tulips written by Deborah Noyes, illustrated by Bagram Ibatoulline, Candlewick Press, Cambridge, Massachusetts, 2004. I planted 40 tulip bulbs two years ago. They came up last year, stretching and reaching for the mottled sunlight our maple tree jealously hoards. They were beautiful though, if a little bent in the sun’s direction. We had tulips on the farm where I grew up. Tulips and peonies, the latter’s sweet smell still brings me back to my childhood. My blossoms are not as prolific or as large as those on the farm were, but they’ll do. I first discovered Hana in the Time of the Tulips at a retreat of the Wisconsin chapter’s Society of Children’s Writers and Illustrators (SCBWI). I knew I had to have the book. Deborah Noyes was nice enough to sign it. 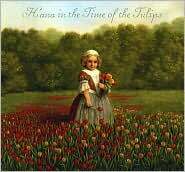 The story of “tulipomania” that swept through Holland in the 1600’s appealed to my history loving nature. Ibatoulline’s acrylic gouache paintings appealed to my “Oh what gorgeous flowers” nature. I am a sucker for flowers. The story tells of a little girl who misses her father. He has not gone anywhere. He is still at home, meeting with important men who smoke pipes and have serious expressions on their faces. But he has been hypnotized by the riches that can be had buying, selling and trading tulips. He no longer plays games with Hana and when he kisses her goodnight, his mind is elsewhere. Father does not see the beauty of the flowers. He sees only the profit to be made. But when the market for tulips crashes in 1637, Father is devastated. Hana devises a plan to cheer him up. This lovely book will appeal to many ages. The smallest toddler will delight in the vivid paintings. The five-year-old will likely empathize with Hana’s sadness about her father’s neglect. Older children will understand the message that greed and riches are not the stuff of happiness. The back matter that explains the history of these bulbs which “…might have been onions wrapped in damp paper” will appeal to the adult reader. This is, quite simply, a beautiful book. Oh, and did I mention that the famous painter, Rembrandt, shows up as a character? May all your tulips be as lush as Hana’s. My Garden by Kevin Henkes. Greenwillow Books, an imprint of HarperCollins Publishers, New York, NY, 2010. One day I walk into University Bookstore, head to the children’s section and whoa! Why are all these people here? I look around and quickly realize Kevin Henkes is the honored guest and he is speaking to a large group of children and parents. How did I miss the news that he was going to be here today? I immediately rush over to the picture book section. Henkes doesn’t do that many appearances in his hometown so I’m not going to miss this chance to get one of his books, signed of course. When I get to the Kevin Henkes collection My Garden immediately catches my eye. It is not a book of his I’ve ever heard of, but the moment I set eyes upon that cover—a little girl with sunhat surrounded by flowers, butterflies and birds—I know this is the book I must have. Did I mention that I’m a sucker for flowers? It goes without saying that Kevin Henkes is a creative genius. He writes and illustrates some of the most beloved children’s books such as Lily’s Plastic Purse and Wemberly Worried. (Look for a review of the latter in the future.) I’m sure I’m not the only children’s writer that is jealous of him for embarking on his successful career at such a young age. The story has been told how, when he was a University of Wisconsin student, he spent many hours at the Children’s Cooperative Book Center (CCBC) studying children’s books. Soon after he submitted a manuscript and portfolio to Greenwillow and the rest is history. He has been fabulously successful and deservedly so. My Garden is the kind of book, like all of Henke’s, that reflects a child’s interpretation of the world around her. As a sometime teacher of kindergarteners, I know firsthand that young children look at the world with “new” eyes, and explore the world in a quest to satisfy their endless curiosity. Students of writing are advised to “show, don’t tell” meaning the author must use dialog (inner or with another character) or some other technique to transmit the scene in a satisfying way without the author’s voice interfering. Henke’s ability to “show” the curious mind of a child never ceases to amaze me. His simple watercolor and ink paintings enhance and compliment this goal of showing the reader the world from a child’s point of view. 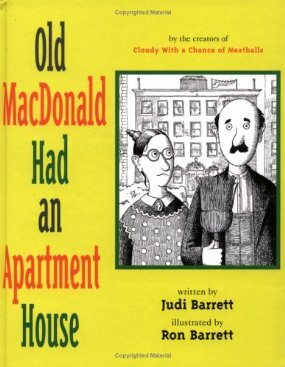 Old MacDonald Had an Apartment House written by Judith Barrett and Illustrated by Ron Barrett. Atheneum, New York, NY, 1969. Long before the urban farm movement there was Judith and Ron Barrett’s Old MacDonald. This is a hilarious book about two people living in an apartment house who really would rather be farmers. The man is the super. His wife wishes she could grow vegetables, but her tomato plant in the window doesn’t get enough sun because there’s a hedge outside the window casting a shadow. Except that I don’t live in an apartment, this could be the story of my futile efforts to grow vegetables when we first moved into our present house. I gave our six mature maple trees little thought when I forged ahead optimistically planting squash, tomatoes and beans. What a disappointment when the tomatoes didn’t set fruit, the beans were few and far between and the squash—well, besides being in the shade, a squash borer set up house and they were history. I switched to flowers. When the owner of the apartment finally shows up to check on his building, he’s horrified to find that his tenants have been replaced by plants and cows. He orders MacDonald and his wife out. But wait—maybe there’s a way vegetables can make him money. This is a quirky book that will especially appeal to kids with a quirky sense of humor. And the adults who love them will get more than a few laughs out of this one too. A Gardener’s Alphabet written and Illustrated by Mary Azarian. Houghton Mifflin, Boston, MA, 2000. I came across this book while substitute teaching one day. Whenever I have a break, I look over the books in the teacher’s room. This one caught my eye with its brightly colored cover of a grandma and little girl. They are surrounded by a flower garden brimming with color. A comfortable Adirondack chair is waiting for when Grandma and grandchild need a short rest. The young child is picking flowers, and a basketful of them sits next to her waiting for more. The detail of this cover, done in woodcut and tinted with watercolors, draws in the reader before ever opening the book. This garden looks real enough to enter. Azarian explains in the front matter that she spent a lot of time around gardens as a girl. Her grandmother had a large flower and vegetable garden and she lived with her uncle for a time who had a small market garden. These childhood memories are reflected in the illustrations many of which show young children working alongside older adults in a variety of gardens. And because this is an alphabet book many diverse types of gardens abound. The most creative is definitely what Azarian calls a xeriscape: a garden that requires little water. This particular one reminds me of a garden my husband and I experienced in Tucson. It was the landscaping around a wonderful little Bed and Breakfast. The author’s love of working and playing in the garden comes through clearly in these illustrations. For example, the M page stands for Manure. A woman in red boots is shown spreading manure—her face is determined but still pleased to be working in her garden. The Q page stands for Queen Anne’s Lace and shows two girls surrounded by puffy white blossoms weaving crowns of wildflowers through their hair . Even insects, the scourge of every gardener, get their own page. The I page is a delightful mix of colorful flowers and every kind of insect imaginable, not all of which are friendly toward plants. This is the perfect time of year to read this book, curled up in an Adirondack chair with a young child–after which she can help dig in the mud. It’s what young children do best!